Well, so much for me reducing my sugar! In my defense though I had some strawberries and soy yogurt that needed using and I have been wanting to try a muffin recipe for awhile now.... These turned out really well despite all my efforts to the contrary. I didn't have enough soy yogurt so topped up with vegan sour cream, I didn't have enough strawberries, I ran out of plain flour and had to top up with self - raising flour, then the batter was too dry and I had to add some rice milk at the end (right at the stage where you should not be adding liquid in a muffin batter!) But, despite all that they turned out lovely, great flavour, super moist and were even better the next day. I then made them again as I was supposed to and I couldn't tell the difference, still light and moist and tasted great, so I will post that recipe. Now, almost all baked goods call for some vanilla extract but I wanted these to really, really taste of vanilla - as it's a flavour that goes so well with strawberries. So in these I used 1 tsp vanilla extract (real stuff please!) as well as the seeds from one vanilla pod. 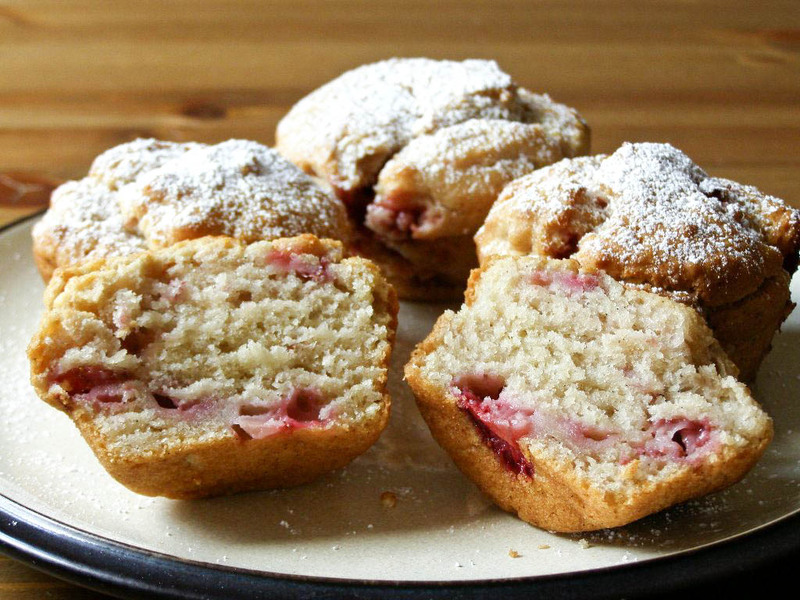 If you click on the pics below you can see the little black specks in the muffins. Do dust with powdered sugar once cool - I left them plain just for the photo but they taste great with a good dusting. Preheat oven to 190C. Brush a 12 hole muffin tin with vegetable oil and set aside. In a large bowl combine all dry ingredients then fold in the strawberries. In another bowl whisk together the soy yogurt, milk, oil and vanilla's - whisk well so that the vanilla seeds don't clump together. Pour the wet into the dry and fold gently until just moistened - do not overmix. 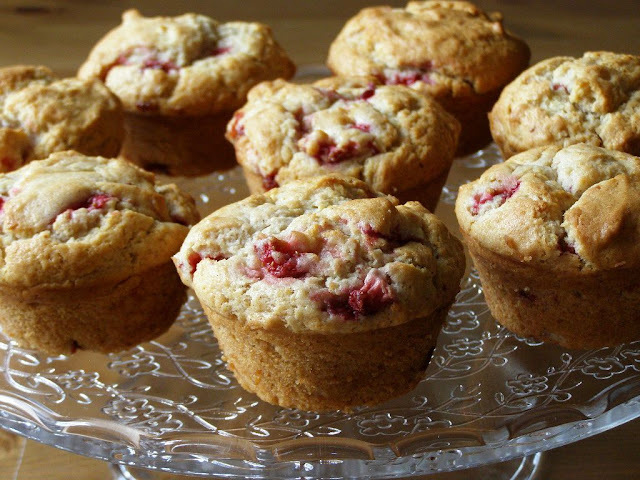 Fill each muffin cup until almost full and bake in the oven for about 20 minutes or until a toothpick comes out clean. Leave in the pan to cool for 5 minutes then remove to a wire rack to cool fully. I had to let them cool upside down due to the bottoms being quite delicate at this stage. Dust with powdered sugar once cool, or at least room temp, and serve. Recipe adapted from Joy of Baking . Your blog is killing me - I love everything! !